Blackinton A3095 Eagle Badge - A3095 - 2 1/4" x 1 1/5"
Home > Blackinton > Police Badges > Badges with Eagles > A3095 Eagle Badge - A3095 - 2 1/4" x 1 1/5"
A3095 Eagle Badge - A3095 - 2 1/4" x 1 1/5"
This popular medium size badge from Blackinton features a shield with eagle and applied panels. With four panels, you can personalize it with department and officer information. A center circle allows for placement of a full color seal of your choice. 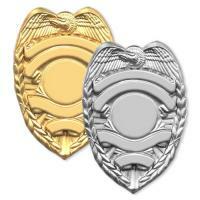 The badge measures 2 1/4" x 1 1/5" and is made from only the most durable materials right here in the USA. Available in several bright gold and silver finishes, please allow 4-6 weeks for delivery. 2 1/4" x 1 1/5"
©2002-2019 CopsPlus.com: Blackinton A3095 Eagle Badge - A3095 - 2 1/4" x 1 1/5"